1) Honda no longer makes that particular door that got hit... It is available from places that have them in stock but you can't order one from Honda anymore. Skins are still available. It hit only the center of the passengers door and caved it in. nothing else was damaged. How should a body shop handle this? I say just buy a $500 door and be done with it. 2) How should the paint be matched? 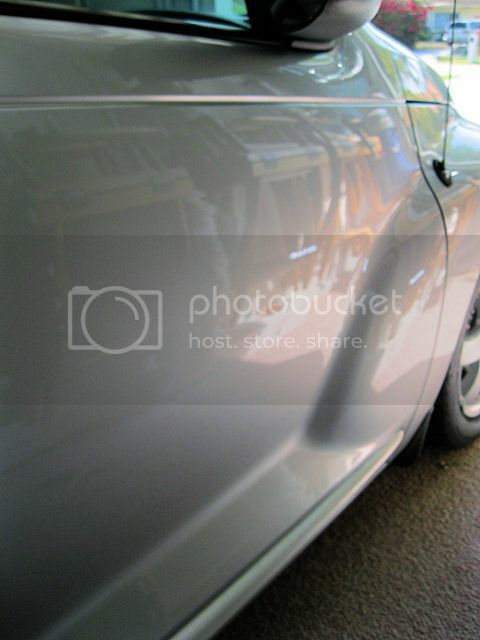 Just paint the door that is damaged or blend it out into the fender and rear door? If the intrusion beam is damaged, the door gets replaced. Fixing beams is not allowed. It would not surprise me if a used door was specified for the job. Blending is usually mandatory on a job like that. You could do it yourself, but you'd have to familiarize yourself with the claims and supplement process used by the insurer. 1.If the frame (inner door) of the door is not bent a new door is out of the question. They will write it for a skin. If you could talk them into a used door that would actually be the best way to repair it. Used parts fit better than OEM replacement parts. Most OEM replacement parts are stuff that was pulled from the assembly line that didn't meet the OEM's quality control standards. Used door would be miles ahead of a skin especially if the Shop/Tech who installs it can't put it on without damaging the skin (happens all the time) and ends up swipe bondo around the entire perimeter of the skin. 2. Standard procedure and what the Insurance Co. will pay for is to blend into the fender and rear door or 1/4 panel (depending on if it's 2 or 4 doors). Most of the time it is necessary in order to have a seamless repair. 3. Euro clear would be fine but unless you do the work yourself a shop is going to use the paint system that they use. They are not going to be willing to use a clear they are not familiar with. Just how it is. 4. I don't know your experience level but know working on the new stuff is quite a bit different than older vehicles. Installing the skin with out butchering it and blending the color would probably be the hardest parts of the job for a novice. Thanks guys. The intrusion beam was barely tweaked. I put a 4x4 on the back side of it and give it a few smacks and the skin ended up back about where it belonged. There is no visible damage to it. The impact was mostly below it and it seems like the pressure there was causing the upper part of the door to be caved in. Once all that was relieved it popped back into place. I appreciate the comments and what to look for/ask. Lot of those cars and Parts around so maybe a good used door in same color. Same color may help in not having to paint inside edges . Good point. Where is the best place to start? car-part.com Every salvage yard in America is on that site. Jim, you say the dent popped back out with no damage. If the paint surface isn't broken down to bare metal, a reputable paintless dent repair place may be able to repair it so you won't know it was ever hit. I didn't think the vertical crease in this door (below the mirror) could be repaired that way so I didn't take a picture of the damage -- it was creased in the main panel and the lower bulge as well. It still looks perfect 12 years later. Mine is much worse. I did not see what hit but something like a hitch hit below the brace and REALLY put a deep 4" crease that stretched the metal and broke the paint while caving in the rest more like yours. Ok I finally got my Civic fixed. They replaced the skin. It is actually a nice job on the skin (I think). What was interesting is that me not knowing what I am doing with an inexpensive gun actually laid down a more orange peel free clear than a pro. I am saying nothing about my skills I have to assume it is just the UC is that easy to put down smooth. So it actually needs to be cut and buffed a little to match better. I am really thinking about wet sanding the whole car in a month or so and shoot a few coats of UC on it. I can tell it has been outside enough in the Arizona sun (5 years) that the clear is on the edge of going.